Our fundamental understanding of human health and disease is better than ever, and scientists are discovering many new molecular biomarkers that can be used as tell tale signs that all is not well with a patient. However, such biomarkers are commonly either too low a number to detect or are unsuitable for detection by traditional means. For us to achieve the ideal of molecular profiling of disease and personalised medicine, diagnostic technologies need to keep up with the discoveries being made in biology and medicine. 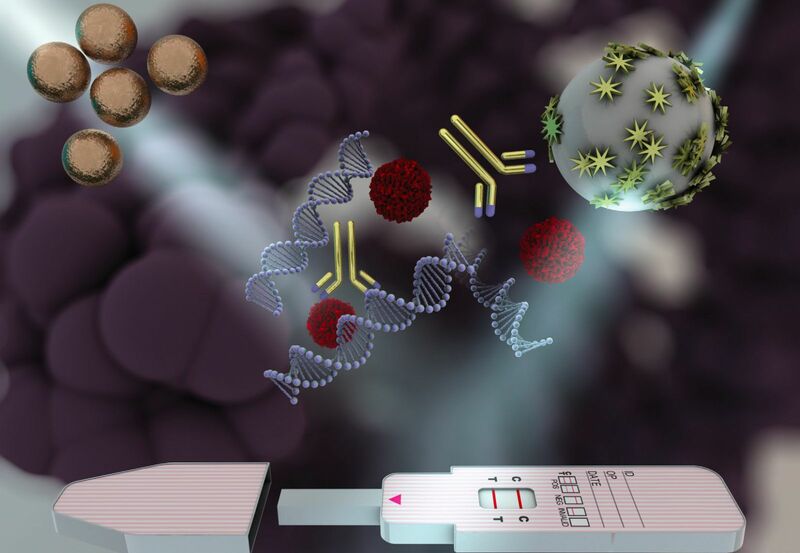 The increased demand for molecular biomarker detection is pushing the development of ultrasensitive sensors, and it is here where new and exciting nanomaterial discoveries are finding application and showing great promise, with scientists exploiting the useful physical and chemical properties of nanomaterials. Once we reduce size of materials into the nanoscale, unique and interesting phenomena often arise that are not observed in the bulk material. The fundamental basis of nano-diagnostics is to link unique phenomena that arise at the nanoscale to the presence of a specific analyte biomolecule, and to modulate the intensity of such phenomena in a ratiometric fashion, in direct proportion with analyte concentration. In our tutorial review, published in Chemical Society Reviews, we discuss the use of plasmonic nanomaterials in the development of biodiagnostic tools for the detection of a large variety of biomolecular analytes, and how their plasmonic properties give rise to tunable optical characteristics and surface enhanced Raman signals. Here, we put particular emphasis on works that have explored the efficacy of their systems using physiological samples in order to highlight the clinical potential of such assays. Although academic research has contributed tremendously to the development of this field, these technologies are not just of academic interest, and there are some high profile examples of technologies that have crossed the academic-industrial divide. Chad Mirkin’s work on spherical nucleic acids1, which are gold nanoparticles with a dense DNA shell, evolved into the FDA-cleared and commercially available Verigene system produced by the company Nanosphere2. It is capable of detecting a wide range of targets for various diagnostic purposes, including clinical microbiology, cardiac, human genetic and pharmacogenetic testing. Another high profile example is the mChip system developed by Samuel Sia at Columbia University3. The mChip combines plasmonic nanomaterial-based sensing with ‘lab on a chip’ microfluidic technology to create a low-cost diagnostic device for use in resource-limited settings.